Scheherazade, the great storyteller of A Thousand and One Nights, , enchanted away thinking with her exotic tales, thus saving the lives of many innocent women. Little did she know that one of her stories, Ali Baba and the 40 Thieves, would change another woman’s life. As a little girl, Laurel Gray was enchanted by this Persian fairytale and was mesmerized by the illustration of the heroine and her dagger dance. This book was her childhood treasure. When asked to donate it to a poor family Christmas, she succumbed, somehow knowing the story would touch her life. The storybook was gone, yet the magic began to weave its way into her life. Music and dance became very important to Laurel. Her dance training began at six with ballet and later moved to modern dance, tap, and numerous ethnic forms. Laurel’s versatility is remarkable, ranging from Berber to Bashkir, from Slavic to Scottish. Music also shaped Laurel’s artistic development. With 12 years of violin and voice instruction, Laura was a member of the Spokane Junior Symphony and participated in many musical and theatrical productions, giving her a solid background in the performing arts. The creative force began to extend into costuming, choreography, and dance research. 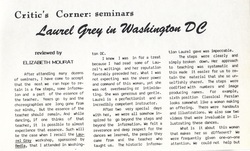 In 1975, Laurel began her study of Oriental dance, training with leading performers and teachers. The following year, she joined a Middle Eastern dance troupe and began to choreograph interpretive routines before investigating more traditional forms. Laurel’s efforts have won respect of members of the Middle Eastern community. She worked closely with the local Turks as publicist for the highly successful Turkish Festival. The Arab community honored her by inviting her to attend a special reception for the visiting Crown Prince of Saudi Arabia. Ercument Kilic, renowned teacher and performer Turkish-Azerbaijani dances recalled his impression of Laurel, after visiting Seattle. “Her extraordinary knowledge of the Turkic culture, history, and the spirit of this people made me more aware of my own identity.” Reza Javaheri, an Iranian visual artist, selected Laurel to appear in a puppet fantasy video he directed because of her mastery of Persian dance. “Her costumes and movements were an exact replica of traditional Iranian court dances. She has captured the essence, both musically and artistically, captivating all with her warmth and Oriental charm.” This also explains why Laurel has become such a popular entertainer Persian weddings and traditional celebrations. “We are very proud of her,” adds Javaheri. Always looking for new challenges, Laurel is currently collaborating with Delilah, Tahia Alibek and Hekete Balducci on a choreography entitled Phases of the Moon, Phases of the Mother, which melds Oriental movements with modern dance. She has also been engaged by the Rubiyat Dancers to choreograph a suite of interpretive Middle Eastern pieces for their upcoming season. And finally, Laurel has spent the past three years developing her original, multi-ethnic concept Dances of the Silk Road. The project will come to fruition this year. A friend of mine once told me of an ancient Eastern saying, “when you are ready, the teacher comes to you.” In 1979, Laurel began a journey paralleling those tales spun by Scheherzade. “It was a clear case of kismet, “ she confided. While enrolled in Russian translation course, Laurel heard about a performance by the visiting Uzbeks. She contacted Ilse Cirtautas, a noted Turkologist, and drove off in search of these performers. When they arrived at the hotel where the dancers were staying, Laurel noticed a young woman in a garden near the entrance. Professor Cirtautas greeted the stranger in Uzbek, and “her whole face lit up,” recalls Gray. “It turned out that this unassuming young woman was none other than Kizlarkhon Dusmuhmedova, one of Uzbekistan’s most famous dancers. That same evening Laurel watched the Dancers Members of the Bakhor Ensemble performed. She was entranced. “To me, this was true Oriental dance – feminine, graceful, playful, and dramatic.The costumes were modest, but sumptuous and colorful. One dance, called Munadzhat or “suffering,”* struck Laurel. Entranced by its rare beauty, she asked Kizlarkhon to teach it to her. She taught the dance to Laurel, telling her that very few had mastered the choreography since it requires a high level of technique, and a great deal of expressiveness. Although she has performed Munadzhat on several occasions, she claims modestly that she has yet to master it, Munadzhat is very demanding, very deep. I could spend the rest of my career perfecting it.” But as someone who has seen Laurel’s Interpretation of this classical piece, it is both moving and inspiring. With her grace and vitality, she brings to life the frozen sculptures of the past. Regardless of Laurel’s of self-evaluation, the visiting Uzbeks were quite taken with her and her dances. The Deputy Mayor of Tashkent, Sabir Yusupov, mistook her ensemble for Uzbeks when they appeared on stage. He was very impressed with Laurel’s talent and sincere interest in Uzbek culture and felt that, if she lived in Uzbekistan, she would have been granted the title “Honored Artist,” and her dance company would have been funded by the State. This was only the beginning of Laurel’s dream -, which she had first visited in to return to Tashkent which she first visited in 1973. The dream became a reality through the efforts of her colleagues, friends, and admirers. All Laurel’s efforts were rewarded when she lnded in Leningrad in September of 1984. In those those euphoris weeks, we was often moved to tears of the intensity of her experiences. She visted museums, art galleries, theatre performances of State ensembles and met dignitaries – from dancers to legendary figures. One such heroine in Tashkent was Tamara Khanum, Uzbekistan’s original feminist. “Now 80, Tamara Khanum dared to dance in public. 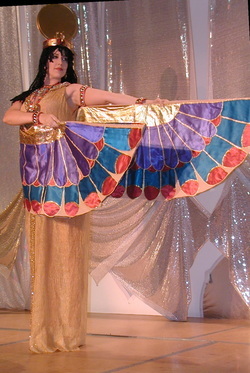 She cast aside her veil and grasped new found freedome to perform her art in public.” After receiving Laurel in her home, Tamara Khanum presented her with several gifts, including a scarf awarded for valor, and praised her dancing. 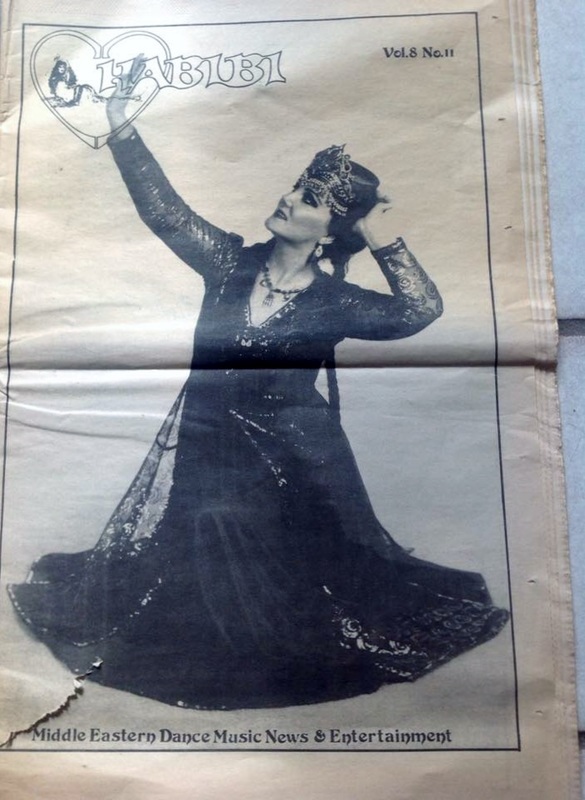 When she learned of Laurel’s efforts to promote Uzbek dance through Tanavar and without government support, she exclaimed “Molodyets [wonderful girl], you are a heroine. Indeed, it must have seemed surprising to watch the cavorting of red-haired American guest in a long denim skirt as she spun and executed traditional movements with the subtle grace of a native. To be accepted as an Uzbechka (an Uzbek woman) by the natives was truly a remarkable accomplishment, and Laurel was to receive an honor beyond any dancer’s imagination. During an official banquet musicians began to play a song. To Laurel’s amazement, what they played was Tanavar. The Uzbeks were quite familiar and excited about Laurel’s dance company named Tanavar and honored her by dedicating the song to her. 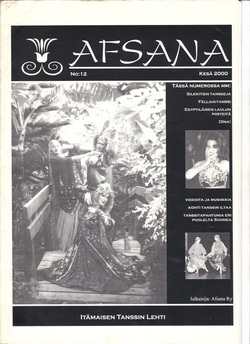 “So I danced”, she recalled, “aware only of the music and the happiness of the dream fulfilled.” A measure of her success was evidenced by the November 30, 1984, article in the newspaper publication Pravda Vostoka, praising Lolakhon (as Laurel was then nicknamed by the Uzbeks) and stating that she had quite literally created a furor with her splendid performance” at a folk concert. Laurel has been sought out for consultation and instruction by dancers nationwide. Minnesota’s Ethnic Dance Theater comissioned Laurel to set as the choreography for the company’s Central Asian suite. I was one of those readers who, in the midst of becoming an Uzbekophile, wrote to Laurel to tell her that I liked her articles. She immediately began to share with me all her painstakingly gleaned information: costumes, videos, books, records and artifacts. Her generosity and expertise opened the door to my personal quest in Uzbek dance. For those interested in Turkic, Persian, and Arabic dance traditions, a visit Seattle has almost become a mandatory pilgrimage. I made such a trip and the result was a deep and genuine friendship. During a bout with cancer last March, I learned the value of our friendship. Laurel began an underground movement to help me fight his illness. She spent hours contacting my colleagues and friends around the country explaining my crisis and asking them to help, I was inundated with inspirational letters and cards wishing me a speedy recovery, not to mention a letter hope daily from Laurel. Her compassionate nature and sense of humor, provided me with the necessary fuel to fight my illness and eventually win. Being in dance for over 10 years, I have seen the gamut of professional and amateur artists. Our profession can only flourish by those who give selflessly to their art. Laurel is such an example. She approaches her art as a true professional. She has it an honest desire to share it, enough respect to do the necessary homework to improve it, and enough faith to let go once it is created. It is not exaggeration to denote her as the pioneer of Uzbek dance in America never trying to popularize the genre at the cost and genuineness. As Scheherazade became a heroine of One Thousand and One Nights, Laurel in her way has become a modern-day heroine. She has rescued Uzbek dance from obscurity and earned for it a rightful place in the dance world. 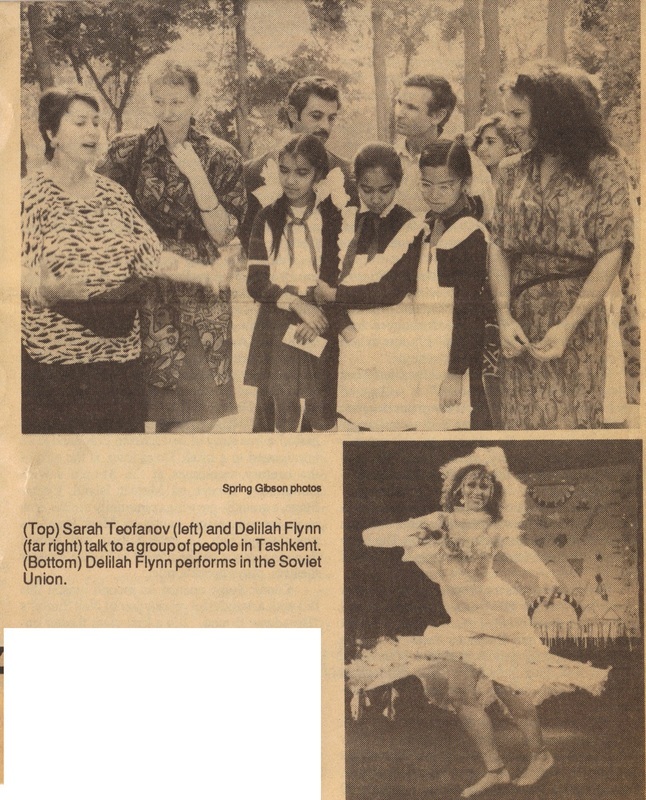 Laurel Gray, Artistic Director of Binaat Sharazad Folkloric Ensemble , performs a bride's dance from the Soviet Union. evening-length "Egypta: Myth, Magic & Mystery." With the passion of an educator and avid storyteller, Gray, along with her 23-member troupe, proceeded to unfold the myths and history of the ancient world. The work is a "reconstruction of what they might have danced like," said Gray, who drew her ideas from ancient Egyptian art as well as current Middle Eastern dance styles. Originally a tribute to the early 20th-century modern dancer Ruth St. Denis, it evoked the dramatic gestures of silent films. A colorful whirl of motion connected a series of recognizable Egyptian tableaux (at times perhaps too recognizable, verging on cliche). A deep voice coming from a smoky netherworld narrated the historical dance-drama replete with striking and sumptuous images: A quartet of glistening aqua nymphs emerged from the Nile, depicted by billowing silk. Thoth, the alligator god and creator of life, made his way across the floor swishing a magnificent gold-and-blue brocade tail. The costumes, designed by Gray and Elizabeth Anna Groth, were scene stealers. Mythic dances were interspersed with ones depicting the everyday lives of people in the kingdom. Women shown harvesting in a ritual dance had a distinctly African flavor, and linen weavers, working at the loom with playful gestures, framed the myths nicely. The evening was a visual treat of whirling, glittery costumes, fluid movement narratives, rich, exotic music and a dance troupe that was clearly having fun. After attending many dozens of semars, I have come to accept that the most we can hope to retain is a few steps, some information and a part of the essence of the teacher. Years go by and the choreographies are long gone from our minds, but the essence of the teacher should remain. And while dancing, if one thins of that teacher, it is possible to almost experience that essence. Such will be the case when I recall the Laurel gray workshop, sponsored by Bedia, that I attended in Washington DC. I knew I was in for a treat because I had read some of Laurel's writings and her reputation favorable preceded her. What I was not expecting was the sheer power and command of this woman, yet she was not overbearing or intimidating. She was generous and gentle. Laurel is a perfectionist and an incredibly competent instructor. After two very special days with her, we were all somehow inspired to go beyond the steps and beyond the information. We felt a reverence and deep respect for the dances we learned, the people they came from and the teacher who taught us. The historic information Laurel gave was impeccable. The steps were clearly and simply broken down. Her approach to teaching was systematic and this made it easier for us to retain the materials that she so unselfishly shared. The steps were codified with numbers and image producing names. For example, sixth position Classical Persian looks somewhat like a woman making an offering. There were also handouts and illustrations. We also saw two videos that were invaluable in illustrating these dances. What is it about this woman that makes her so different? We were frequently given one-on-one attention. We could not help but trust this calm and communicative teacher with penetrating eyes. She said she was not a "hit and run" teacher; we were to know she is the kind of instructor who would remember our names and even answer our letters. She bonded herself with the women in the class in more ways than one. Her opening statement concerning the Uzbek dances was that women had been put to death as a result of doing these dances. She put us on our honor to not abuse these dances. It was clear her mission is to preserve, resurrect and protect the dances that are so precious to her, I wonder how the Middle Eastern dances we so often see performed today would look if there had been this steadfast safeguarding in the early years. The study of Uzbek dance was a new experience for most of us. The video. "Dances of the Silk Road." produced by Laurel (See Middle Eastern Dancer, Nov. 1987 issue for review) was informative and entertaining. As a visual aid, it was an interesting vehicle for teaching the history and culture of the Uzbek people. This, I feel, is an essential part of learning a "foreign" dance. Otherwise, we find ourselves doing shallow renditions of what I call "orphan dances." There is no depth, no substance, no lineage -- just fluff -- and not very good fluff at that. You know the type of class where all you get is technique with no reference to roots -- "...a shimmy shimmy pop and a hip to the left and a hip to the right and a smile so cure and a rib shift right and a left right left...etc." You walk away wondering what you just did and invariably forget it all. Laurel reminded us repeatedly how cultures shapes dance. We flt new understanding and compassion for these remote people who most of us had barely heard of before. The Classical Persian workshop was delightful. Laurel performed a mime sequence that was absolutely spellbinding. In an instant, her emotions flashed from gaiety to fear to pride to anger and she carried us right along with her. Throughout this improvisational piece, she wore a mask, communicating all of these images with only her body. Yet beneath the mask, we could see her eyes blazing. She was someone else with each change. It was breath-taking. We then had an opportunity to try our own "hand" at this art as we applied imaginary make-up to ourselves. This exercise was to illustrate the mimetic aspects of Persian dance. 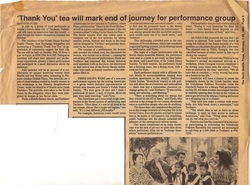 Our individual make-up sequences were later added to the Classical Persian choreography. This piece was lyrical and moving. We painted pictures with our poses. The postures were directly taken from antique miniature paintings and other works of Persian art. Her choreography followed logically and skillfully balanced different speeds, levels, and moods. We had just enough repetition and time with this choreography to be able to work on it at home. The videos of the Persian dances were exciting and revealed a great deal to us about the courage and grace of these dancers. Laurel's example, her exercises and her anecdotes impressed upon us the essence of this lyrical and fluid art. We also developed a deep concern for the plight of the Persian dancers __ many of whom are in grave danger. Classical Persian dance is an elegant form of poetry in motion and how valuable for us to have people who can pass this on to the new generations. In these tragic times for Iran, there is the very real danger that these exquisite antique dances may be lost forever. This could be likened to deforesting a magnificent primeval mountain. Should that unforgivable day ever come, I feel confident that Laurel will be wandering over the hill defiantly planting her seeds. The dances will not be lost as long as there is breath in her body.